St. Louis is every highway planner’s dream. Consistently ranked among the least-congested cities in America, the region’s car commuters spend a smaller share of their trips to work sitting in traffic than all but two other cities. That means St. Louis car commuters aren’t encumbered much by other car commuters, just like in those car commercials. 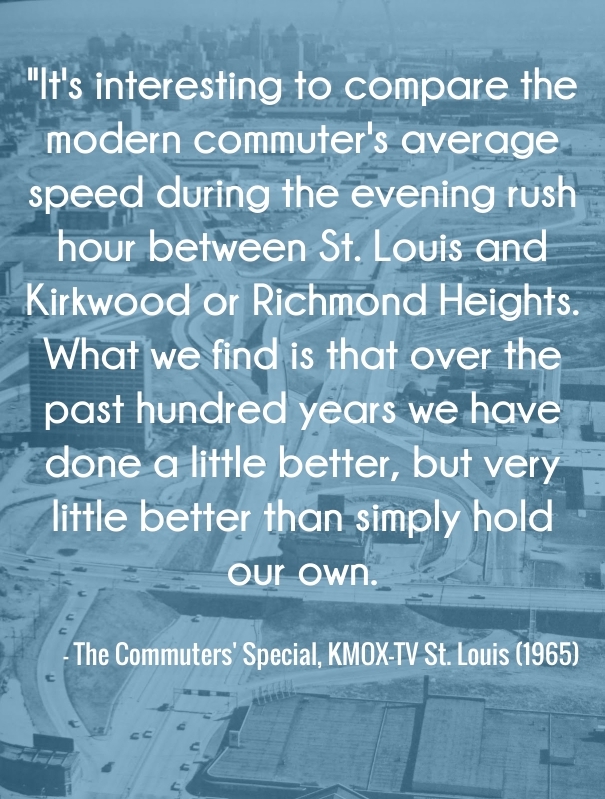 As congestion has declined in St. Louis, commute times grew. Peak hour commuters spent an average of 289 hours behind the wheel in 2009, 36 hours more than in 1999 when congestion was significantly worse. The reason for longer commutes, even if that time is spent moving faster? Between 1950 and 2000, St. Louis’s urban population grew 48% while urban (developed) land area grew by more than 260%. Sprawl has meant longer transit trips as well. In 2008, MetroLink riders travelled an average of 7.3 miles per trip, 6th most in the country amongst light rail and metro rail transit systems (APTA). At its worst, accidents, flooding, (a little rain, the sun in driver’s eyes, a hill) etc., can slow traffic to a crawl. More than a century ago, the horse car, the city’s first public transit vehicle, could average six miles an hour. An hour commute from downtown Kirkwood to downtown St. Louis would be an average of about 15 MPH. Today, the rush hour commute can often be about 40 minutes, or roughly 23 MPH. Elsewhere on the Network today: Comeback City says Baltimore’s problem isn’t a bad economy, it’s sprawl. And Mobilizing the Region reports that Amtrak has a timeline and budget estimate for the Gateway project to improve rail access between New Jersey and Manhattan: 15 years and $24 billion. How Much Would Most People Pay For a Shorter Commute? Do the costs of congestion outweigh the costs of building wider roads? Probably not. Despite an impressive amount of data, Inrix falls into the same old traps with its congestion report.